With the newest expansion, Mansions of Madness will turn into Meadows of Madness or something like that, because in Call of the Wild there is not a mansion in sight. But forests. And fields. And horrible, slimy, squamous, tentacular monsters. Some things never change. The expansion will contain new board tiles for your ultimate outdoor experience, five new scenarios to get your shoes muddy in, new allies and new options for Investigators and Keepers alike. Get ready to get your feet wet. Speaking of expansions, here’s another one for Talisman. The City sounds like it may offer some entertainment after a hard week of questing in the wilds, but that’s obviously just wishful thinking. Things in the city are just as dangerous as everywhere else, if not more so. Talisman: The City includes a new game board – one of these funky ones that fit around a corner of the original board, I like those, they are fun – city-specific quests, new characters and new end-game conditions. Everything you’d want, really. Including the option to bribe the sheriff to lock up the other players. More games need that option. Continuing with card previews for their upcoming expansion, Alderac gives us “Le Chat Rose” from Nightfall: Crimson Siege. I don’t know about pink cats, generally I would distrust them, but for getting actions back from the discard pile I will put up with oddly coloured felines any day of the week. 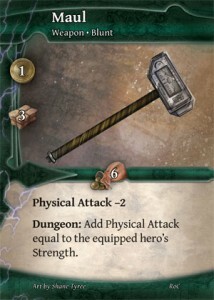 Thunderstone must reach a whole new level of nasty monsters with Roots of Corruption, at least the weapons are designed to hurt. A lot. I like the concept of the Maul that your typical, scrawny wizard type can’t even lift. There’s one thing that may be more nefarious to make gamers drool for your game than frequent and detailed preview blog posts: trial versions. And since the people at Alderac are evil masterminds when it comes to making me want their games, that’s exactly what they produce: Courtier Lite is a print-and-play version of Philip duBarry’s Courtier. You will have fewer options to curry favour – Courtier Lite has less than half the cards and about half the courtiers of the full Courtier – but to get a first impression that should help a lot. You know when is a good time to panic? Zombie apocalypse. Damn brilliant time to panic, I think. And so do the makers of Dead Panic. It’s not a coincidence that the name is so similar to Fireside’s own Castle Panic, the basics are very similar: you find yourself in a cabin in the middle of the woods, defending it against zombies coming from all sides. But Dead Panic doesn’t simply put a new theme on the Castle Panic mechanics, it goes further. Along with the undead, survivors appear from the forest, and you want to make sure they reach your cabin. Each survivor brings a piece of a radio that you will use to call the rescue team. When they finally show up, it’s every meeple for himself: you make a break and run for the edge of the forest. A pretty cool way to build a new game on the basics of Castle Panic. The rulebook for Robinson Crusoe: Adventure on the Cursed Island is now available. You might want to plan some time for reading, with 18 pages it’s not the shortest rulebook on the planet, but the game seems absolutely worth the effort to learn it. The other good news is that the English edition will be available from Z-Man Games in early 2013, so your chances of finding Robinson in your friendly local game store just increased dramatically. This may be the most interesting preview post for Aztlán, and not because it announces that there will be a two-player variant of the game – although that is great news. The good part is to read what problems Aztlán originally had with two players and what step was taken so they wouldn’t spoil your fun. Read for yourself, but it’s a rather neat idea that I don’t recall seeing in a game before. It must be Tolkien week at Cryptozoic’s office, they announced two new games based on the world’s most famous fantasy author’s works. The Hobbit: An Unexpected Journey follows the travels of Bilbo Baggins and his dwarf companions in a cooperative game, facing one to four players with challenges that require fighting skills, diplomacy, or the old and honorable art of running away. There is no official word, but German publisher Ravensburger is preparing a game with the same title that is also authored by Reiner Knizia – we’ll have to wait and see if they are the same or not. In the other new project, Cryptozoic are once more living out their passion for deck-building games. The Lord of the Rings: The Fellowship of the Ring Deck-building Game – this will be a big box release just to fit the title – is exactly what it says on the box. I’m a bit worried by the announcement that “players start with basic combat manuevers” and “defeat the deadly forces that serve Sauron” – LotR is not what I’d call combat oriented fantasy, and it shouldn’t be, either. That’s another “we’ll have to wait and see”, then. Making gamers’ mouths water: David Luis Sanhueza does it like a real boss with the recent preview post spree about Legends at War potato. (I had to insert a potato there to carry the last link. My apologies if I confused you, it has nothing to do with the content of the link.) He talks about the game basics, the battle system, card abilities, pretty much everything that goes on in the deck-building mythical conflict-oriented board game. It’s pretty cool to know that various deities, spirits and suchlike will beat the stuffing out of each other, but so much more fun to learn how they do it. I see a lot of potential there. 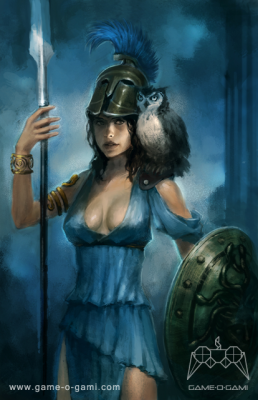 I also like the art a lot, have a look at Athena and tell me you don’t. The rules for Shadows over Camelot – The Card Game are now available through the intertubes, and I’m really not sure what to make of this game. It leaves the basic concepts of Shadows over Camelot intact, you still may have to deal with traitors among you, knights still go on quests to find the Holy Grail and defeat the Picts, but mechanically there appears to be a lot of card-counting and a bit of luck. But then, I trust Serge Laget and Bruno Cathala to make a good game, so I’m sure there is more to it than meets the eye after skim-reading the rules. I am curious to try out how the traitor mechanic feels in this context. The promised look at the Mr. Card Game rules is online now, and fans of the online game Kingdom of Loathing will feel right at home between Grungy Pirates with their Acoustic Guitarrr and the Naughty Sorceress. As is good and proper for the genre, your main occupation is killing monsters, taking their stuff and levelling up – all resulting in adding cards to your deck, of course, since Mr. Card Game is a deck-building game. Weird and funny is virtually guaranteed, and it’s looking promising for a fun game as well. The Kickstarter campaign for Mr. Card Game still has seven days to go, so if this preview convinced you, you can still jump in. The town of Hoi An in Viet Nam is a well-preserved south-east Asian trading port. It’s architecture mixes European and local influences and then mixes some fairy tale into it – especially once every lunar month when all modern illumination in the streets is turned off and all light comes from paper and silk lanterns. This photo was taken my Jean-Marie Hullot and shared with a CC-BY-SA license.